Huelva is a lesser known corner of Spain. One of the 8 Andalusian provinces, located on the western tip of the country. Bordering with Portugal the best get to Huelva from abroad would be to fly into Seville or Faro airport and drive across to Huelva. As this region is not as well known as Seville or even Cadiz, this undiscovered part of Spain may just be the tonic you are looking for. With great food, beautiful unspoilt beaches and lots of sunshine it´s worth a visit. 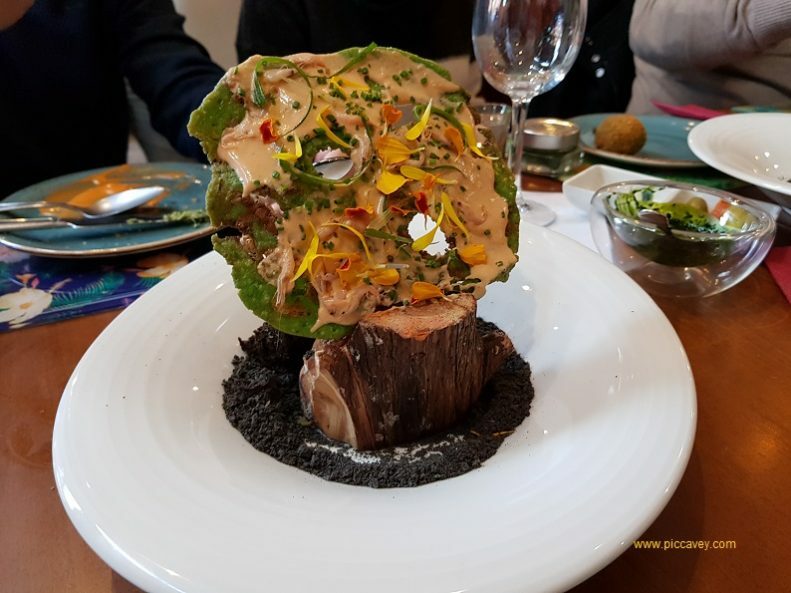 I travelled west last week to find out more about the delicious food produced in this corner of Spain. 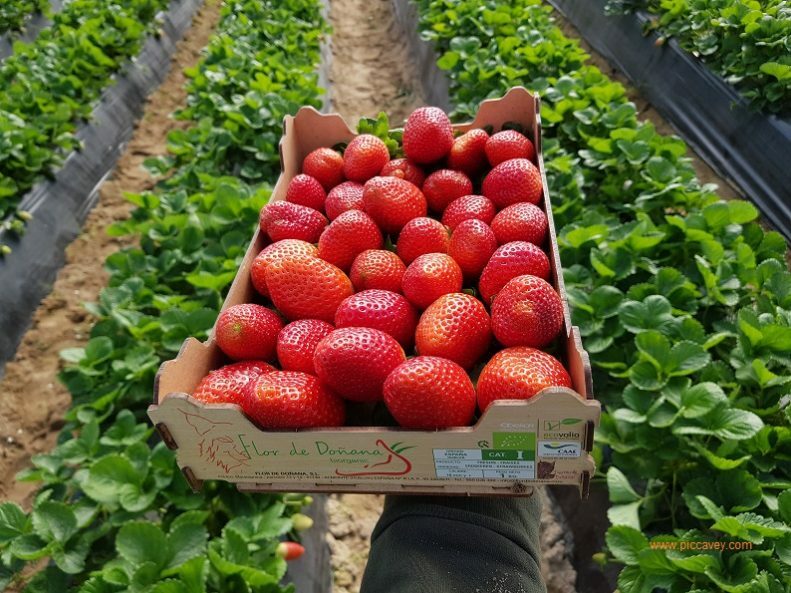 Huelva is famous for producing strawberries. The fruit season begins in December and lasts until June. 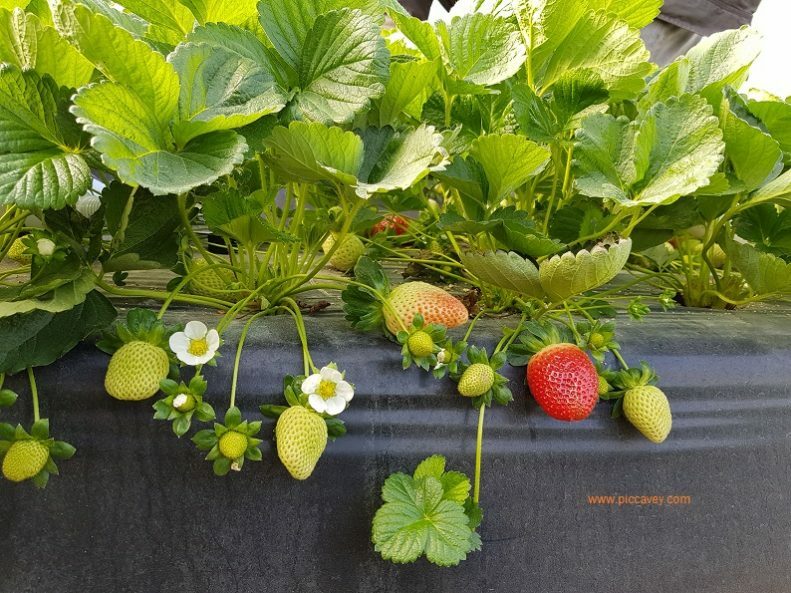 These beauties are Organic Strawberries at the Flor de Doñana producer. I picked this box of fresh strawberries in Mid December. The weather was cool but sunny and bright. At this producers as well as Strawberries they also grow Raspberries, Blackberries and Blueberries. In the UK their Organic berries are stocked by Waitrose and Sainsburys when they are in season. So if you see the Flor de Doñana brand you now know exactly where there are from. I tried Sabrina and Rabida strawberry varieties that day. Both were absolutely delicious. 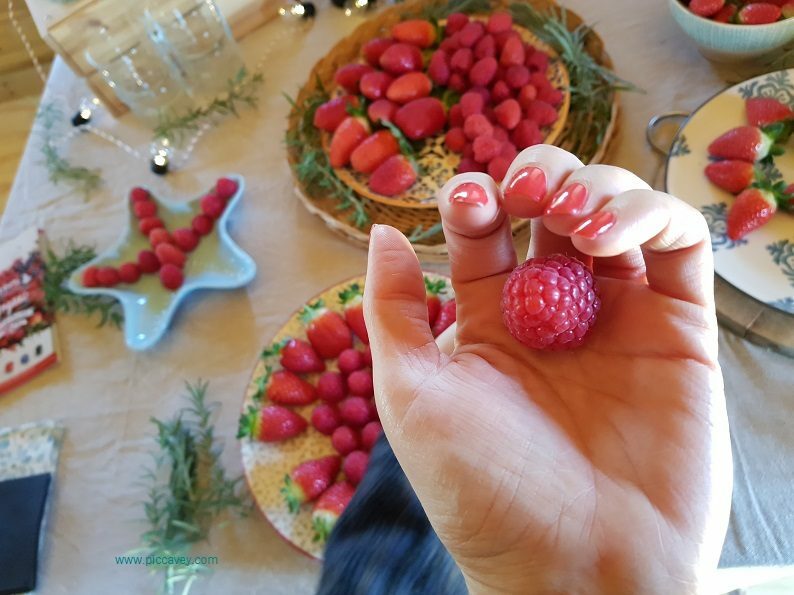 Such a treat to enjoy fresh strawberries in December. 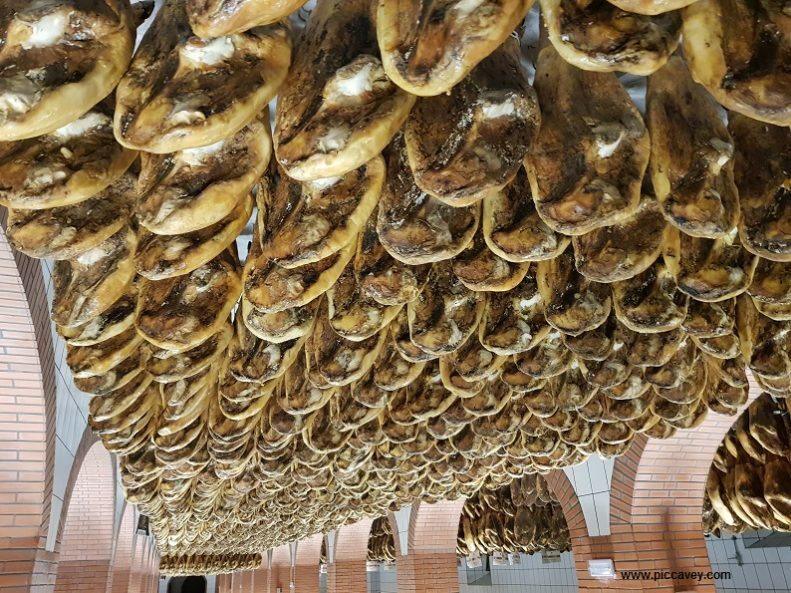 Another world famous food produced in Huelva is Iberian ham. 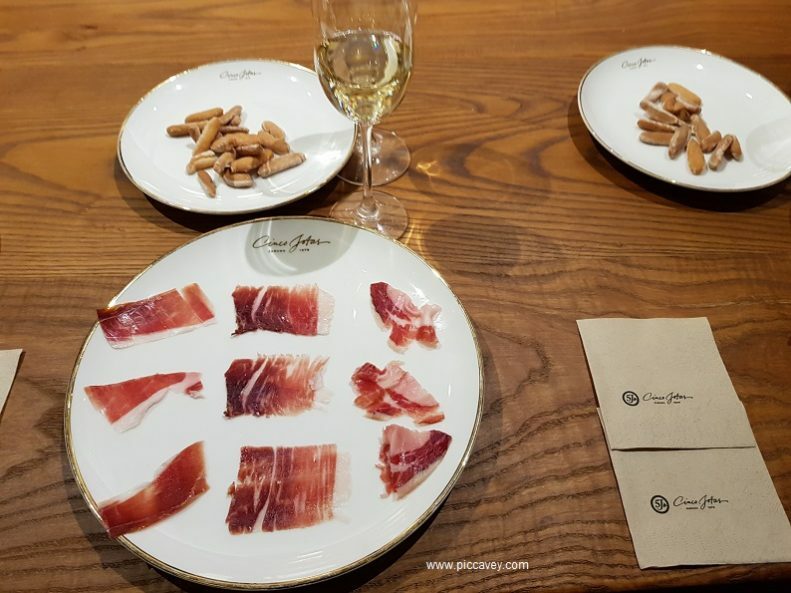 Cinco Jotas is one of the most prestigious producers of Spanish ham. Located in Jabugo, a small town nestled in the Sierra de Aracena. The surrounding land is a forest of Holm Oaks loaded with acorns and Cork tree. This is the perfect terrain for the pigs to graze in. 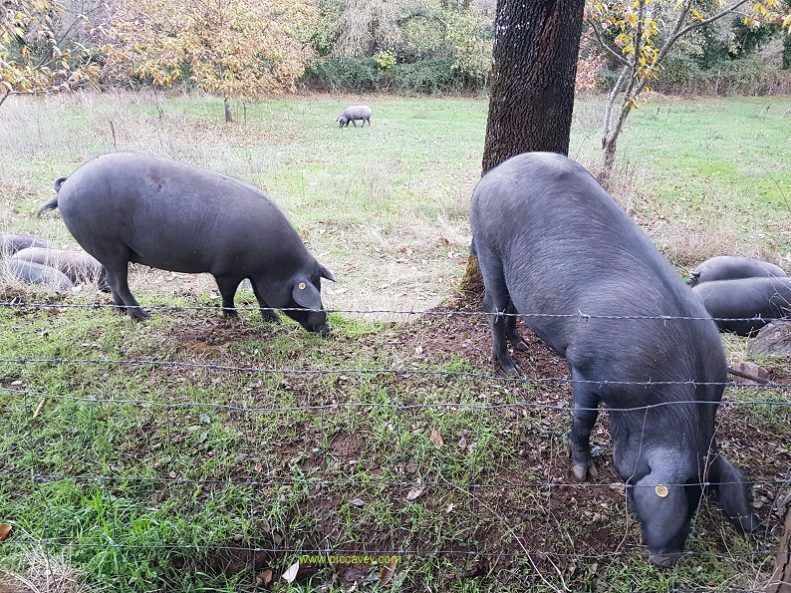 Each pig on the Cinco Jotas Estate has the equivalent of two football pitches of space to roam in. To ensure they have enough acorns for each pig. This exquisite food is packed with omega 3 which of course is in the ham. Making it a healthy way to indulge. Eating 40 grams of Iberian Bellota Ham is actually a good thing. Visiting Cinco Jotas is certainly ham heaven. The Bodega is of course well stocked with ham. The tour explains the entire process from the pig breed, how they are reared and how their team select, carve and hang the hams. Nothing is left to chance throughout the five years of each ham. Each stage is meticulously cared for and controlled. These words refer to the different ares on the leg of the ham. The agricultural use respects the eco system and the area thrives along with the ham industry. Both work together hand in hand conserving the areas biodiversity. Another great example of such practices is Doñana. 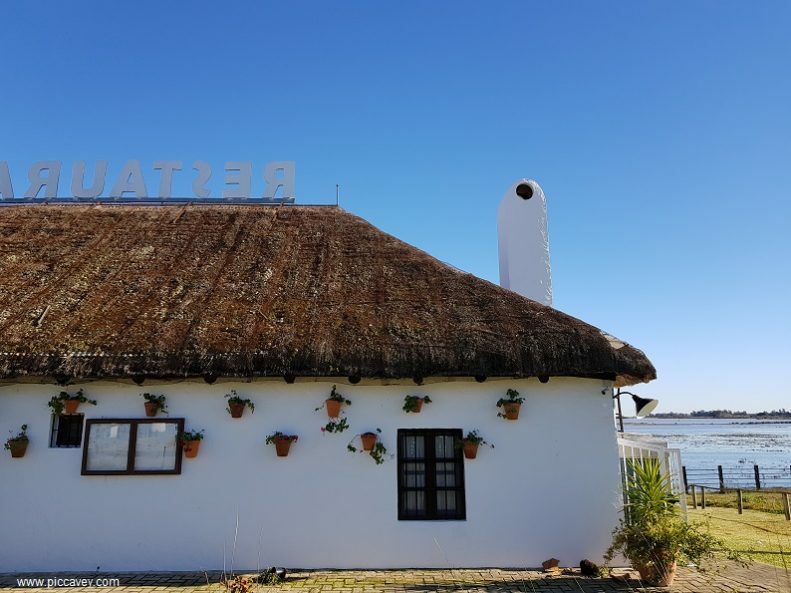 At Veta la Palma, a fish farm located on the edge of Doñana Natural Park in Seville province also respect the river and marshland. Doñana is UNESCO World Heritage site and most known for the great diversity of bird species. An area covered in lagoons, marshland and mobile dunes, it is home to five threatened bird species. Also it is one of the most important heronries in the country. Of course seafood in this region such as Gamba Roja and Sea bass are managed in a sustainable environment. Finca Veta La Palma have a limited production to maintain high standards and excellent quality. 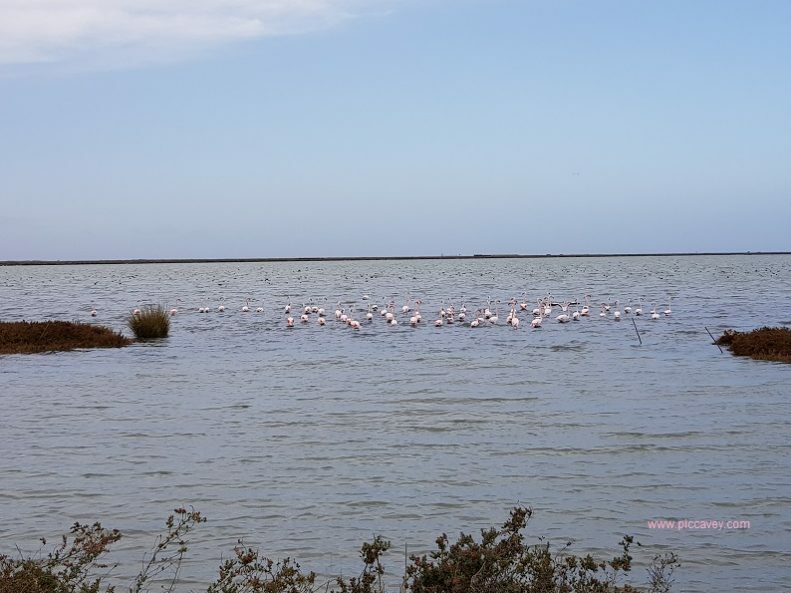 This sustainable fishing method respects the natural area in Doñana park and ensures that their project will last for generations. Tasting this at lunchtime was quite an experience, it can be used in concentrated form to add to dishes such as risottos for example. However I tried it in a shrimp fritter, known as Tortilla de Camarones which is typical in the region. At just 3.50 euros it´s worth asking for, it brings a lot of colour to the table. A real conversation piece. 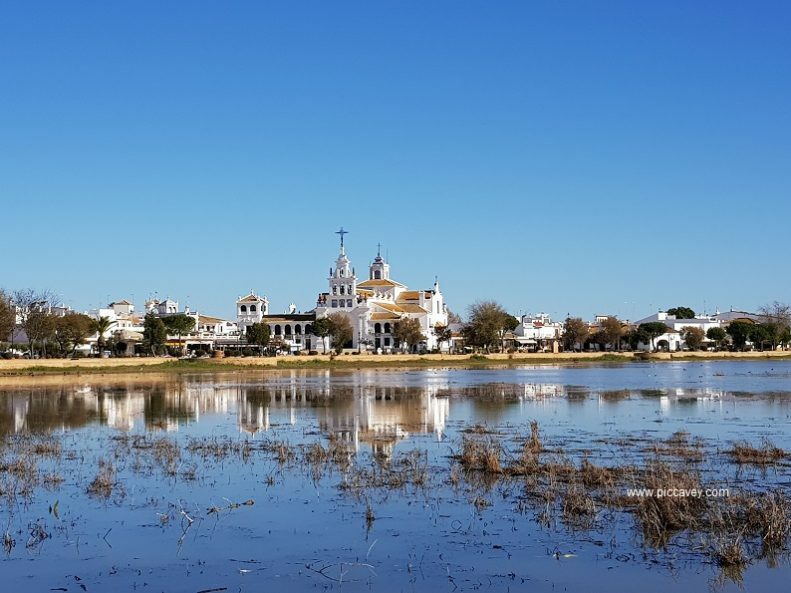 No visit to Huelva is complete without a visit to El Rocio. Seen in this photo above El Aldea del Rocio is a white village where many pilgrims comes to once per year to visit the Virgen del Rocio. Dressed in Flamenco attire and often in carriages pulled by horses and mules, this colourful festival is quite colourful. In December of course things were much quieter but we still saw some horses in the aldea of course. This area is agricultural and their ties with the equestrian life here are strong. We stopped off for lunch at this beautiful waterside restaurant. 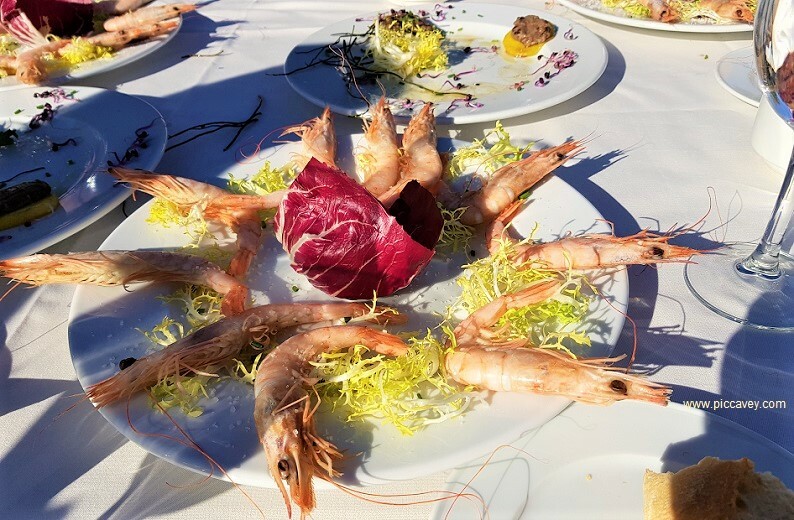 On the menu were the typical fresh prawns from region, Grey Goose fillets and a delicious plate of Sea Bass. Rest. Aires de Doñana was a stunning setting too. The table was outside (in December) in the winter sunshine with views across the water. We had binoculars to spot the Flamingos, ducks and other waterfowl on the Doñana park. Such a relaxing setting. it was difficult to actually leave the table. Other things I have left for another trip is the Columbus Route in Huelva city. This area also has Iberian Lynx which are an endangered species, you can go to spot them in the landscape with local experts. Birdwatchers will of course love this region and sunworshippers too. The province of Huelva has some fabulous beaches such as Mazagon and Punta Umbría. So I have to return to Huelva sometime soon. 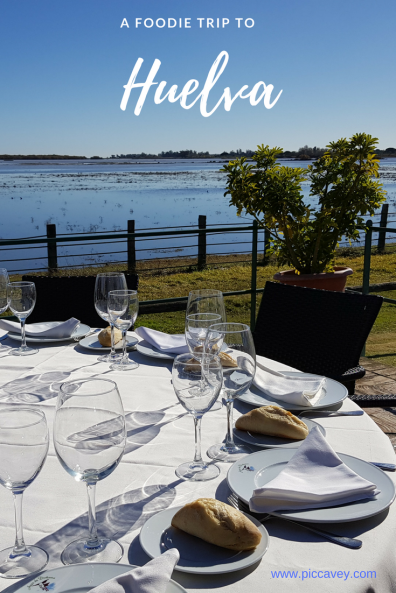 Thanks to Tasty Andalucia for coordinating this delicious Andalusia road trip.